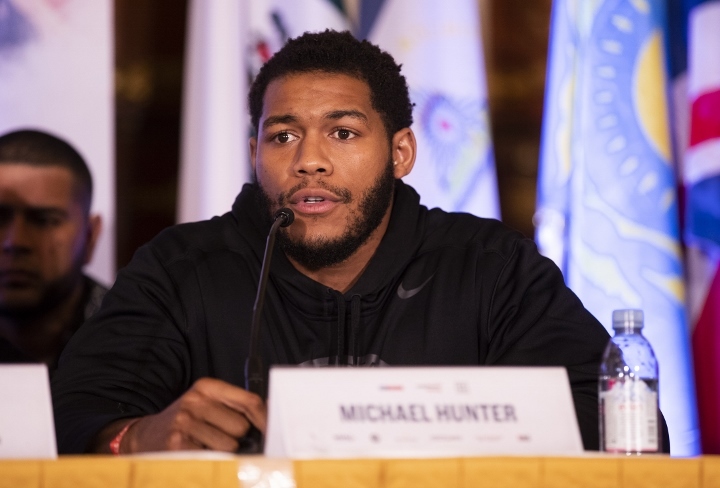 "I've been telling everyone I'm on a mission to become the heavyweight championship of the world, and that I would go overseas and bring back knockout victories," said a confident Michael Hunter. "I had no choice, I knew I needed knockouts, or else I wouldn't get a decision in their native land. In both fights with Ilunga and Ustinov, I dug deep and got them both out of there. I believe in myself and I know I can beat any contender, or any of the heavyweight champions out there. With Rahman in my corner, no one is going to stop me." "Michael hunter is the best heavyweight in the world," proclaims former two-time heavyweight world champion, Hasim Rahman. "Hunter beat every American heavyweight in USA Boxing from 2008 -2012. Michael has the heart, the speed, the DNA, and underestimated punching power to capture the heavyweight championship of the world. In addition, Mike has been in the ring with the likes of Tyson Furry, sparred with Deontay Wilder, Luis Ortiz, the Klitschko Brothers, and more than held his own with them all. There's no reason why Hunter shouldn't be considered a serious candidate for a title shot. We're willing to fight Joe Joyce, Dillan Whyte, Trevor Bryan, Joseph Parker, or any other heavyweight contender to earn a shot to all the heavyweight champs. I believe Hunter beats all current heavyweight champs right now." "I know my name is hunter, but I'm not a typical hunter with a gun." Hunter concluded. "I promise I won't shoot to kill, I'll just knock you out, and you will live to fight another day. It's hunting season!" "Mike Hunter is the future of the heavyweight division," said Rahman. "Any of the names I mentioned, feel free to go goodnight. Mike Hunter will defeat you and put the world on notice." I would love to see Usyk vs. Hunter rematch @ HW! If not Usyk, then put him in with Povetkin or Hrgovic! Dillian Whyte would be a good opponent too, especially on ESPN! "Hunting Season!" I like that! I have been mentioning Hunter as a Fury opponent on these forums. Hope it happens! some good fights there to really test him, Povetkin, Whyte, Parker, Miller after he gets KO'd etc. Pulev and those kind of people too.